Chips can actually be made from kale? Kale chips taste good? In our house, the answers to these questions are “yes” and “yes.” I first read about kale chips at Simply Sugar and Gluten Free, and was amazed at how easy it was to make them. Since I already knew that I liked kale, I decided to give this idea a try. The result was a light and crunchy chip with a great flavor. It is a great alternative to potato chips, as well as a nice sandwich topper. 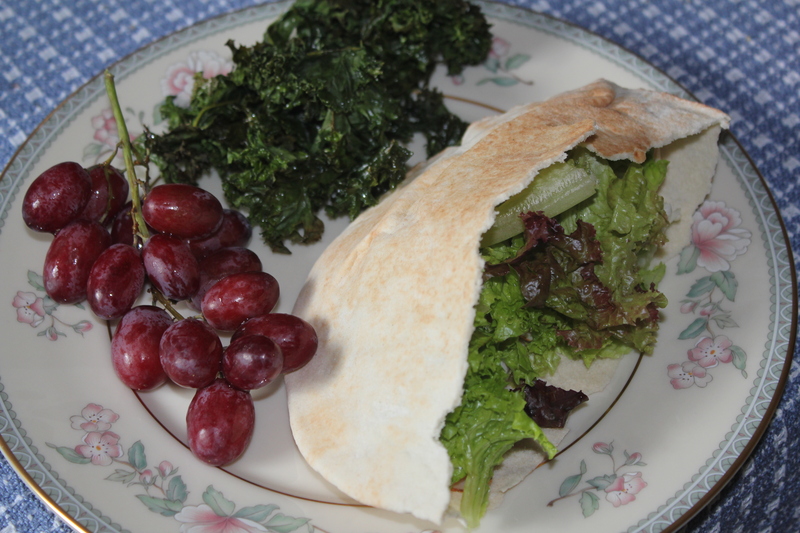 The picture is of my lunch the other day – I had a side of the kale chips with my turkey sandwich on yeast-free, sugar-free pita bread from Chatila’s Bakery. To prepare, I did the following: wash and dry the kale, and pull the kale off of the stalks. Rip the kale into bite-size pieces. Place kale on a cookie sheet and drizzle with olive oil. Sprinkle with kosher salt and freshly ground pepper. Bake at 400 degrees for 15-20 minutes, until kale is lightly browned. I hope you give this recipe a try whether you are a kale lover or novice. You won’t be disappointed! I am sharing this recipe with Miz Helen’s Country Cottage, Food Trip Friday and Cybele Pascal Allergen-Free Cuisine. This entry was posted in Recipes - Snacks, Recipes - Vegetables and tagged Cane sugar free, Kale, Vegetable, Yeast free. Bookmark the permalink. I love kale chips, too! I have never eaten them with a sandwich. It’s a great idea. I usually just eat them as a snack right after making them. They don’t last long. I found it amazing how many kale chips I could eat in one sitting! Thanks for visiting; your blog is outstanding! I tried the chips – excellent taste! Keep the recipes coming. I’ve been making kale chips for about a year as a delicious crunchy alternative for potato chips, and it is a delightful replacement! One cup of steamed kale contains 1328% RDA Vitamin K and 354% RDA of Vitamin A. Kale and arugula are also delicious cooked gently with EVOO and garlic until they wilt and then added to a pasta of your choice. Add mushrooms and/or tomatoes and you receive many vitamins, fiber and protein. Way to go! Sharon, thanks for the nutritional information along with other ideas for enjoying kale. We also like it sauteed with olive oil and garlic. It’s simple and delicious. I just love Kale Chips, and what a great idea for the sandwich. We would just love that. Hope you are having a great holiday week end. Thank you so much for sharing with Full Plate Thursday and hope you will come back soon! that looks delish and healthy choice too 🙂 Dropping some love for Food Trip Friday, hope that you can return the favor too. Thank you, thank you Miz Helen for featuring this recipe on your web site! I hope that you enjoy them!